No matter who you are or what you do, there's an inescapable fact. In your life, only a few of the things you do will produce the majority of effects, results, or rewards you experience. In 1906 an Italian economist, Vilfredo Pareto, discovered that 20% of the Italian population owned 80% of the nation’s wealth. Further studies revealed that The Pareto Principle, as it became known, affects us all in every aspect of life. If you can identify which efforts get the best results, you can apply your time and focus far more effectively. In other words, you do more of what actually matters. 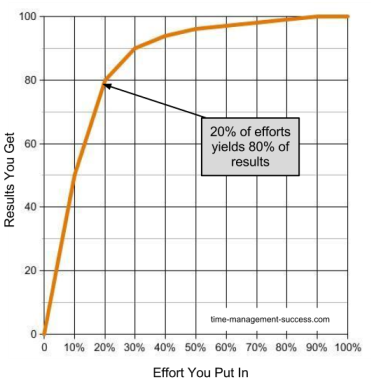 20% of your tasks produce 80% of your results. 20% of a meeting gives you 80% of the information. 20% of your contribution produces 80% of the recognition you get. 20% of clients create 80% of your sales. 20% of the clothes in your wardrobe are worn 80% of the time! 20% of colleagues account for 80% of your attention. It’s important to remember that the 80-20 'rule' is actually a principle. It can be 80-20, but it’s not set in stone; it doesn’t have to total 100. For example, a teacher may have a class where 99% of discipline issues are created by 10% of students. The principle reveals the way it really is. What, or who, is getting too much, or too little, of your time and attention? Are the 20% of people who create 80% of the value overlooked? They may be if they don't make as much 'noise' as the 80% who only produce 20%. Use the Pareto Principle to re-address the balance. Applying 80-20 thinking means you do more of what works and less of what doesn’t. Learn how to prioritize your work to identify, and then focus on, the ‘vital few’ for maximum benefit. For example, in which 20% of your space do you spend 80% of your time? Focus on making that space a pleasure to live and work in. As the above diagram illustrates, just starting a task or project is the most effective thing you can do. As time goes on, you reach a point of diminishing returns in terms of results for your efforts. Understand the 80-20 rule and you can decide if it’s worth continuing to achieve 100%. Often, though, 80% is ‘good enough’. As you practice it more, you'll achieve an increasingly accurate idea of how much time and effort to apply. This makes overcoming perfectionism more viable in any situation. Remember that it's a rule of thumb, not a hard and fast law. Sometimes 100% is necessary to take 'good' to 'great'. To produce top quality or to achieve completion, you need to go the extra mile. It may be true that 80% of a road is built in 20% of the time, but the lines still need to be painted. In your personal and professional life you’ll increasingly recognize this principle. Use it if you want to learn how to prioritize your work.